In April, the Auerbach Central Agency for Jewish Education (ACAJE) hosted a lecture at Congregation Adath Jeshurun in Elkins Park by noted Jewish thinker on childrearing, Dr. Wendy Mogel. 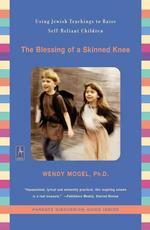 Dr. Mogel's best-selling book, Blessing of a Skinned Knee, now in its twelfth printing is a must read for all parents, Jewish or not. We are fortunate to share Anne Miller's insights from Dr. Mogel's lecture and how to apply her wisdom. Wendy Mogel speaks to all who are raising children. She talks to parents, grandparents and educators. Her message is simple. Parents must "stop rescuing their children. Children need to feel bored, heartbroken, cold, wet, and hungry. Kids also need a crabby unenlightened teacher. They will one day have a crabby unenlightened boss or spouse." Dr. Mogel's wisdom comes from years in private practice. She found that parents spend too much time manicuring their children's environments or frittering their days converting their children's neurotic misery into ordinary unhappiness. This constant attention to making everything palatable is creating a generation of children who do not appreciate what they have or tolerate what they don't like about their lives. Considering the parents from her practice Dr. Mogel asked, "Why are we training our children that everything is replaceable, that all their deeds are worth glowing accolades, and that we exist as their personal concierge service?" Mogel feels that parents need to be proactive as they take control of their parenting. The first action is simple. Say, "No." The more often parents say no and stick to their decisions the easier they make it for their children to understand that no is final. If parents enforce ?no? children learn that hearing no is not a signal to polish debating skills but a reminder that parents have made a permanent ruling. Dr. Mogel advises that implementing ?no? will make it easier for children to say no to their friends when friends nudge them to cheat on a test, harass students on the bus, or take drugs. Since families are often geographically distanced from their extended family, Wendy Mogel encourages like-minded parents to organize themselves into mutually supportive groups. Research conducted by educational consultant James Stenson, found that "parents befriend other parents who share their basic values and their dedicated commitment as parents. They receive affirmation that as parents they are on the right track." Stenson's research reveals that as families bond with others, they not only gain friends and a support system, but also they develop a kinship much like those that are found in an extended family. Dr. Mogel suggests forming these groups anywhere parents gather. Consider coming together after Shabbat services, when the children are in religious school classes or during the preschool hours. Discussion groups in Jewish settings can cover topics that are important to parents and help foster strong links to their Jewish community. Dr. Mogel's desire for finding a way to help families cease raising egocentric children brought her to the teachings of Judaism to raise children with rich traditions and spiritual values. "Remember the Torah tells us to teach our children how to swim. We must raise them to leave us, to make mistakes, and suffer from longing for things while they're young so they will be able to survive without us." For more information about parenting activities hosted by the Auerbach Central Agency for Jewish Education, visit their parenting site. A parenting group discussion guide for Dr. Mogel's text is also available. Raising A Mensch Section Editor: Dr. Flaura Koplin Winston parenting @ pjvoice.com, Founder and Scientific Director of the Center for Injury Research and Prevention at the Children's Hospital of Philadelphia. She welcomes your comments, questions and suggestions for future columns.